Hello! Come in and dip your toes in Handmade Harbour! You'll find me on the harbourside chatting about digi stamps, sewing, painting, running a craft business and contributing to craft magazines. I have a finger in way too many craft pies but that's the way I like it! Hang around for Handmade Monday, a weekly linky party for crafters. It's an eider duck, which she loves. She was thrilled with it, and I'm mostly pleased with it although the duck should have been a bit higher on the bag. His feet get a little lost at the bottom. I get annoyed at myself when I make silly mistakes like that. and the fabrics. 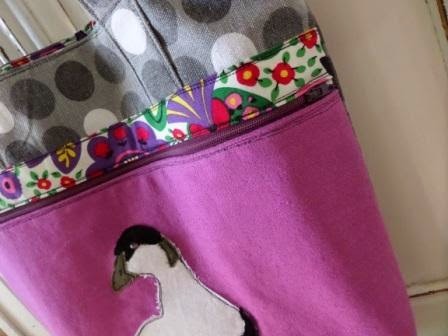 The grey dotty canvas is an excellent bag-making fabric as it's quite robust. The gorgeous lining fabric, also from Wholeport, is one of those fabrics which seems to go with lots of things - it's so bright and happy. We had our first shopping trip together yesterday - to the post office and Asda! I can see that all future shopping trips are going to take twice as long as usual - everyone wants to say hello to Quentin. At this stage, he gets carried around like a baby (and of course, he still is a baby yet). He's already getting better at using the "outside toilet". 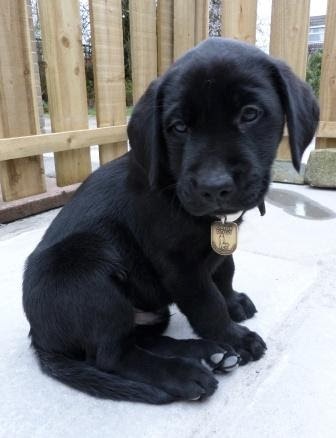 Guide Dog puppies are trained to go outside straight away, and always on concrete or paving. He's already getting better at it (or maybe it's just that I'm getting better at knowing when he wants to go!). 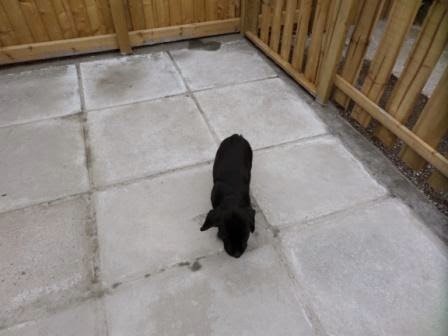 He has a fenced-off area for his toilet, which looks huge compared to him! I can see it's going to be so hard to give him up when he's ready for his next stage training!! No wonder I was given a contract to sign! OK, back to Handmade Monday! What have you been making? Soo much loveliness in your post today! 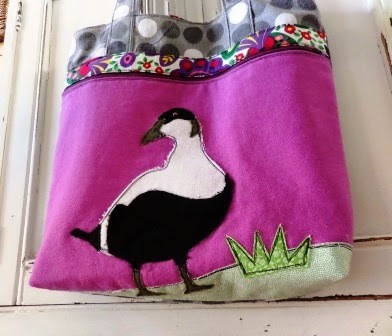 The bag you made for your sis is gorgeous, the eider duck is such a quirky and attractive decoration and all the fabrics you've used work really well to compliment it. Quentin is just gorgeous. You are lucky to have him. The bag is lovely, I love your choice of fabrics. I've done lots of 'it should of been up a bit, down a bit, a bit bigger, a bit smaller' it's annoying but hopefully I remember for the next time. Very pretty bag and very cute puppy! aaaahhh, he is so lovely. I find it very hard to give up the kittens I am fostering, so can imagine that after having quentin for a year it will be heartbreaking. 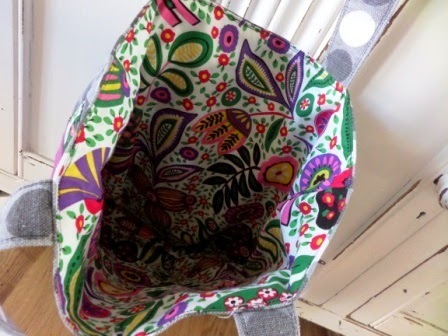 The bag you made for your sister is really lovely - gorgeous lining. Hope you (and Quentin) have a good week. Fabulous bag- love the lining. Quentin is just gorgeous! Wow, so much cuteness to look at in this week's post. The bag is absolutely beautiful and clearly made with love, your sister will have been delighted with it. Quentin, what can I say? He is just beyond adorable! Quentin looks like he's right at home already. 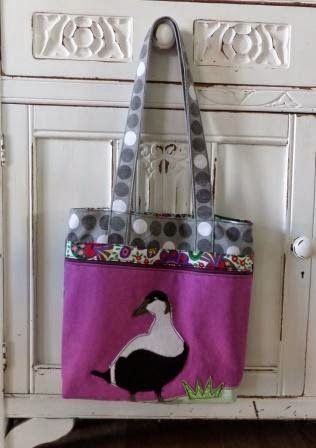 A lovely bag for your sister, the lining fabric is just gorgeous. How lucky is Quentin to have you and you to have him ... he is gorgeous, absolutely adorable. I don't know how you can get anything done at all with Quentin around, he is so adorable. It's a glorious bag and the lining is a beautiful riot of colour. Oh, and the fur-baby is scrummy! That is one lovely bag! I assume you made it a while ago and had to wait until after you'd given it to her to share it with us. That lining fabric is gorgeous, just my cup of tea! Quentin is lovely! Right at the other end of the puppy spectrum, when I was a kid we had a retired "mum" from the guide dogs. She had had almost 100 puppies who became guide dogs in her working life (her eyesite wasn't good enough for her to be a guide dog herself) She was the most lovely. sloppy, saggy, loyal friend. What a wonderful bag. Love the applique. The bag is beautiful and I'm in love with Quentin he's adorable. Visit Wendy Massey's profile on Pinterest.